The distinguishing charcteristic of Synchaeta is a crown of cilia on the forefront that build a paddle-like organ. This feature allows the organism to make quick movements in its aquatic environment. Although they contribute to a balanced ecosystem, Synchaeta species have no known importance to humans. 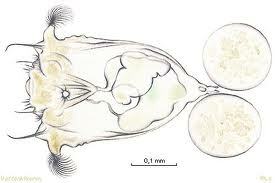 "Synchaeta-rotifers". Vattenkikaren. Retrieved from: http://www.vattenkikaren.gu.se/fakta/arter/rotifera/synchaet/synce.html.